Swooshing sea, zinging wind, mermaid-song and tinkling ice-cream vans… all the sounds and sights of the seaside burst free in these frolicking rhymes! 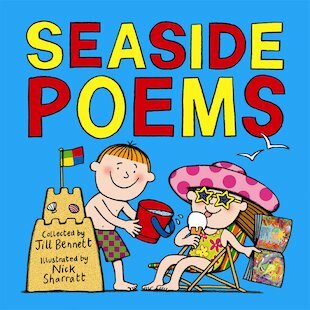 These wonderful poems are full of splashing, squealing, bouncing noises which simply beg to be said out loud. Just add rainbow-bright pictures from top illustrator Nick Sharratt to get everybody in the mood for a day at the beach!